Product #134 | SKU 8-003-0042 | 0.0 (no ratings yet) Thanks for your rating! The microMatteBox standard bundles are a great way to control flare and help control lighting when shooting. The Redrock microMattebox is the first cinema-grade matte box designed for the budgets of indie filmmakers, owner/operators, film students and educators, and budget-conscious studios. No longer is there a compromise between quality and cost. The microMattebox offers a flexible solution for managing light and controlling flare, allowing you to configure your eyebrows/flags and filter stages to exactly meet your needs. 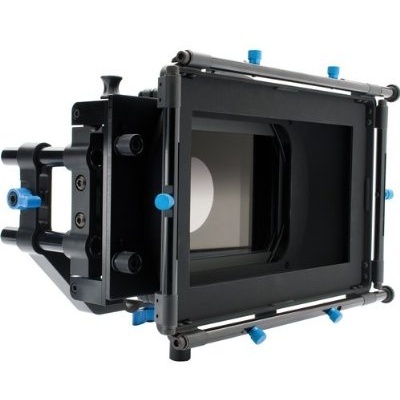 The microMattebox is a universal matte box and works with video cameras, 35mm lens adapters, and film cameras. The microMattebox is also compatible with the Red One. Universal mattebox: Works with video cameras, 35mm lens adapters, and motion picture film cameras. Please note the microMatteBox does not come with support rods or baseplate. these are available separately from Redrock, or can be used with industry standard 15mm lightweight or 19mm rod systems. This Bundle does not include hardware for flags as shown in picture. Flag hardware is included in the flag kit or the microMatteBox Deluxe Bundle. This microMatteBox Bundle requires 15mm lightweight support system for attaching to your system. Filters are not included, but are offered as an add-on accessory.